I have been going to Southeast Alaska for quite a few years. One of my friends form earlier days in Seattle has been living there for summers for 30 some years and has an old 1966 Plymouth Belvedere that has sat outside in his yard for almost all of this time. Summer, winter all year round it sits there. Snow, rain, wind, ice, dirt, nothing seems to affect its ability to start and run smoothly each summer. 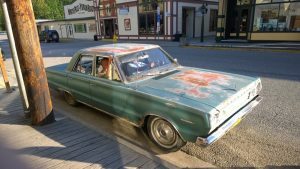 The body is showing some signs of age but each year with a jump start it starts and runs and we take it for a drive around Skagway, Alaska. 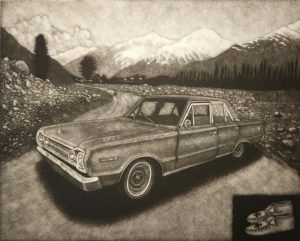 This is quite a commendable story and at my friends suggestion to commemorate this amazing car I made a mezzotint of it. I put it on a well known road on the edge of Skagway and hopefully captured some of its character.